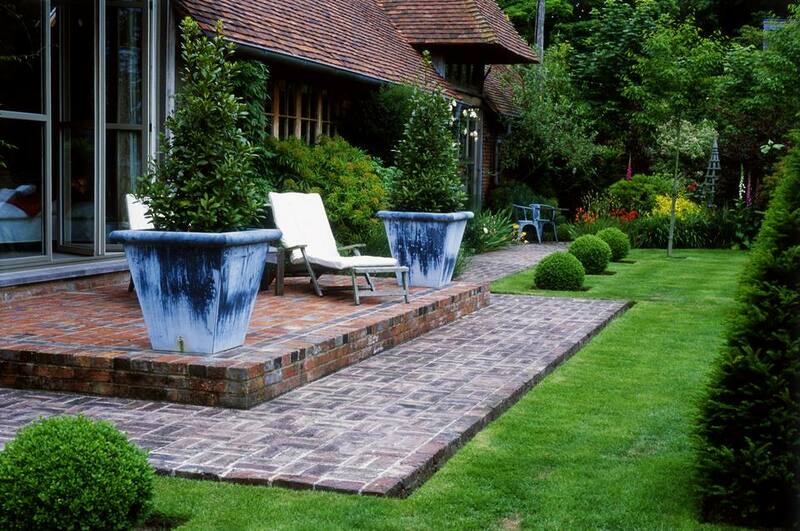 When laying bricks--for instance on a brick patio--various designs, or paving patterns can be used. One of them is known as the "basket weave" pattern. Other popular brick patterns are the herringbone and running bond. There are also variations on each of these basic designs. The name "basket weave" is a reference to the way that strands of brick seemingly disappear under other bricks that they meet perpendicularly, then become visible again on the other side -- just as when crafters are weaving actual baskets. Two bricks standing vertically, right under that first one. To the right of that group of three bricks, you will have another group of three with just the opposite pattern (that is, two verticals on top and one horizontal on the bottom). A more complex variation is called the "boxed" basket weave pattern. Like the "double," this type can be thought of as consisting of units of eight. Except, here, you first lay six bricks so as to create the perimeter of the "box" shape, then fill the center of the box with the remaining two. What might influence you to choose one design over the other? Ask yourself, "What will I be using this brick walkway for, primarily?" The practical trumps the aesthetic, so let's consider a practical example first. If you will be using it to transport compost from a compost bin over to a garden area--using a wheelbarrow, for example--do you really want to be navigating a long and winding road? On the other hand, if aesthetics and not practical concerns will be driving your selection, you may well choose the curving path; this design can inject an air of romance into your landscape.